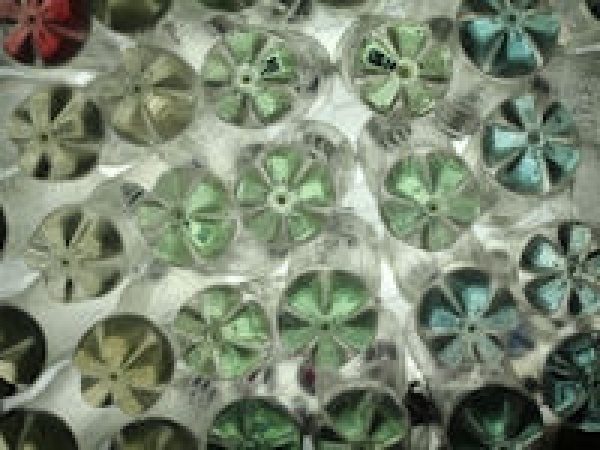 Picture shows: Plastic bottles re-used as a cladding material for buildings. Residents of Stonehaugh and its neighbouring villages are invited to discover that there’s more to recycling than they thought. Thanks to an interesting technique known as ‘upcycling’, architecture students at Newcastle University are searching for green gurus that can make a difference to their community and environment and help to create unique products. Designers using old newspaper to make furniture, gardeners adopting plastic bottles and guttering to create growing habitats, and architects building homes from shipping containers are all examples where materials are being ‘upcycled’ to make them more valuable, useful, or simply aesthetically pleasing. Peter Sharpe, art and architecture curator at Kielder Water & Forest Park, said: “Upcycling works in opposition to consumer culture, encouraging people to think of new and innovative ways to reuse things and materials once they have fulfilled their initial function. We’re really looking for the community to come and engage with the students, join in and contribute to a discussion on how the idea of upcycling might be applied to rural environments”. An evening of presentations and discussion by architecture students, staff and others will take place at Stonehaugh village hall. The event is part of Super-use, a project developed by Newcastle University and Kielder Art & Architecture that is encouraging students to develop design projects that look at ways of being able to do more with less. As part of this, the students are also interested in finding out how their ideas can be applied to ‘real’ situations and are keen to hear what people living in rural communities within Kielder Water & Forest Park think of their plans. Residents are invited to attend a free event at Stonehaugh Village Hall on Tuesday 12 March 2013 from 7pm – 9pm to hear more (refreshments included). The project is supported by the Paul Hamlyn Foundation and Kielder Water & Forest Park Development Trust. For more information contact Peter Sharpe on 01661 855 660 or peter.sharpe@visitkielder.com. Kielder Water & Forest Park has become the largest open air art and architecture gallery in the country and Kielder Art & Architecture has won many awards including RIBA (Royal Institute of British Architecture) Awards for Kielder Observatory and Kielder Belvedere.